Disconnect battery negative terminal before starting operations. Do not shock EPS control unit, e.g. drop or hit. Do not get EPS control unit wet with water or other liquid. Also, do not give EPS control unit a radical temperature change to avoid getting water drops. 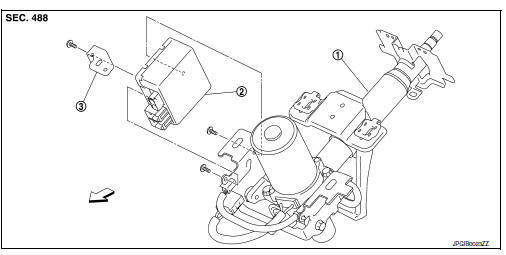 Do not disassemble or remodel EPS control unit, EPS motor, torque sensor, harness and harness connectors. Remove steering column assembly. Refer to ST-12, "Removal and Installation". Remove EPS control unit from steering column assembly. Remove bracket plate from EPS control unit. Check that harness is not damaged when installing EPS control unit. Also, check that EPS control unit is installed without pinching harness or trapping foreign materials.